Sore, bleeding gums can indicate the beginning of Periodontal Disease. However, periodontal disease often has no signs detectable by you until it is quite advanced. This makes an evaluation by a dental professional even more critical. If untreated, discomfort, bad breath, and tooth loss will result. Research has detected a strong link between gum disease and other diseases such as heart disease, stroke, diabetes, and low birth weight babies. If indication of gum disease exists, a non-surgical, very comfortable treatment is available for many stages of gum disease. Straightening crowded teeth that are difficult to clean can also be advantageous in managing gum disease, and we are often able to accomplish this with clear aligners. 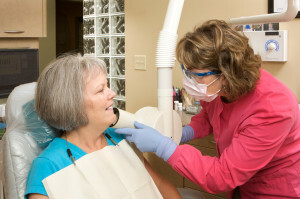 If you have periodontal (gum) disease, Scaling and Root Planing (SRP) is needed. Gum disease is caused by bacteria and we often recommend SRP be accompanied with an Arestin anti-bacterial treatment to make sure the root cause of the gum disease is being addressed.